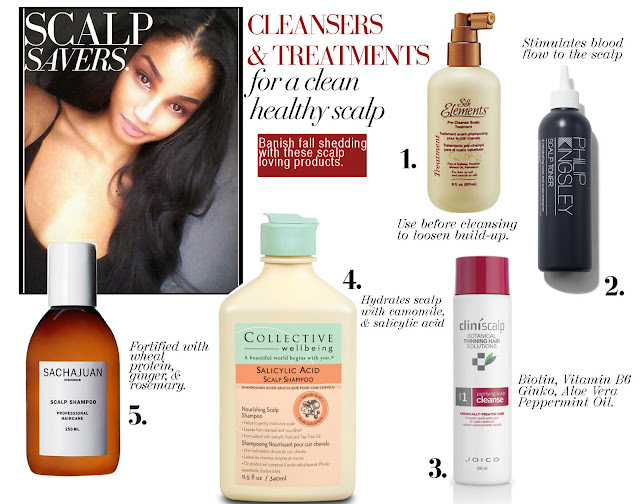 Hair Regimen Essentials || Healthy Scalp Treatments that you need to try now. Fall's here. That means that it's time for my annual onslaught of scalp health related posts. This tradition began a few years back after suffering dearly at the hands of seasonal shedding. My dermatitis flares up during the dryer, cooler months. Then seasonal shedding begins. Before I know it, I'm battling massive shedding, tangles, and ultimately, a minor setback. Then I learned the key to avoiding this horrific cycle. When fall comes around, I shift my focus making scalp health the number one priority. That philosophy has served me well. So I've decided to stick with it.....and maybe even take it to the next level. Which is why I'm amassing a small list of must have healthy scalp products to elevate my current regimen. A healthy scalp is a happy scalp. Not only do these products battle dryness and flaking, but they can actually stimulate the hair follicles to promote healthy growth. Silk Elements - I like the idea of a pre-cleanse to loosen build up and prepare the scalp for the wash. Shampoos are great but sometimes, I feel like my scalp doesn't as clean by shampooing alone. Since we're already doing a pre-poo treatment anyway, why not add this simple step to get your scalp truly ready for the cleansing process. Silk Elements has just the product for you. Simply add to the scalp prior to cleansing (and before starting the pre-poo), let sit...and by the time you wash, any excessive scalp build up is loosened and ready to be cleansed away. Philip Kingsley Scalp Toner- I'm a fan of the Philip Kingsley brand, which is why I was excited to learn of their scalp toner. The bottle nozzle allows for easy access. In true toner fashion, Philip Kinglsey contains witch hazel (astringent) along with a few ingredients to combat bacterial growth. This would be a great choice for those of you who protective style using braids or extensions. And like most great scalp products, the toner also has menthol to provide that wonderful cooling effect. Joico Clinicure- This scalp nourisher doesn't only claim to cleanse the scalp, but to also address scalp related hair loss as well. Which is why Joico has fortified Clinicure with vitamins A, E & B6. Want more? How about biotin, ginko biloba, plant extracts and castor oil? Joico is more than a scalp cleanse, it's a scalp nourisher too. Sachajuan Scalp Shampoo- Another shampoo made specifically for the scalp. It too has salicylic acid to combat dryness along with rosemary oil, menthol (for stimulation/circulation) and ginger. I also appreciate the addition of sorbic acid to lower the pH, keeping the product scalp healthy. Sachajuan is definitely on my must try list. If your regimen only focuses on shampoos + conditioners, I invite you to open up to a new world of possibilities. The simple act off adding a scalp specific product could completely change the direction of your hair journey. We absolutely need a healthy scalp product as part of our wash day rotation if we want to experience our healthiest hair ever. Thanks for posting. I also exfoliate my scalp much more during the winter months. It balances out my sebum production and I don't have dry scalp in the winter. ORS has one too, which i'm gonna try for the first time ever next week. This is a great post. Healthy hair starts with a healthy scalp! I'm going to try the PK toner.